A striking native conifer, that lends itself perfectly to smart hedges and teriffic topiary. Fabulous quality, pot grown yew hedging. For quickest and best results plant 25-30cm apart. Produces slow-growing thick hedges that clips back very neatly. Supplied as 3 year old plants in 9cm pots, very well rooted. Yew is an English native tree with dense, dark foliage and forms superb, dense hedges from 1m to 3m or more, providing excellent screening, almost total shelter from wind and weather and excellent privacy. An evergreen conifer that is easy to manage, it grows at 20-30cm a year, quicker than many people think and once its desired height is reached, it's easy to maintain. Yew responds well to frequent trimming, but also, if you're short on time, it can also be cut just once a year in late summer. 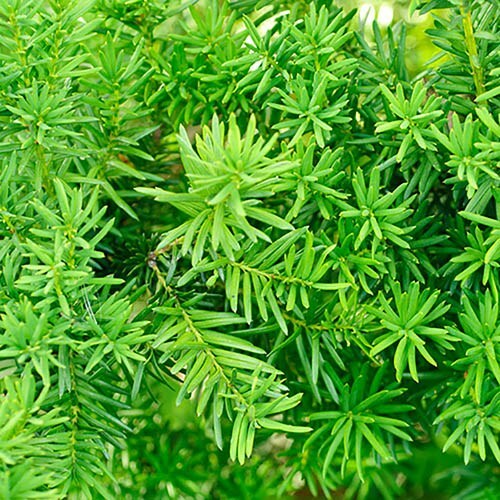 Densely growing, yew is very easy to grow, shade tolerant, very hardy, and will grow in most soils apart from heavy clay. With bright green growth in spring and bright red autumn berries (which are very attractive to wild birds), Yew will also provide texture and fresh colour in your garden, especially in winter. Supplied as 10 x established plants in 9cm pots, ready to be planted out straight away. Supplied as a pack of 10 plants, established in 9cm pots, ready to plant out. Space 25cm apart for the perfect hedge. Potted plants can be planted any time of the year, at 4 plants per liner Metre of hedge. Do not trim for 2 years after planting. To plant, space plants approx 20-30cm (3/4-1ft). Water your plants well and dig a hole a little deeper and 3 x wider than the nursery pot. Add a soil conditioner such as well rotted manure to the earth removed from the hole if necessary to lighten heavy, poor soil. Place your plant in the hole at the same level at the pot then refill the hole with the earth removed (backfilling). Water well and mulch around the base of the plant with a collar, compost, gravel, bark etc - Yew needs plenty of water in the first couple of seasons but should not sit in waterlogged soil.